GM is teasing the new Zafira Tourer Concept. 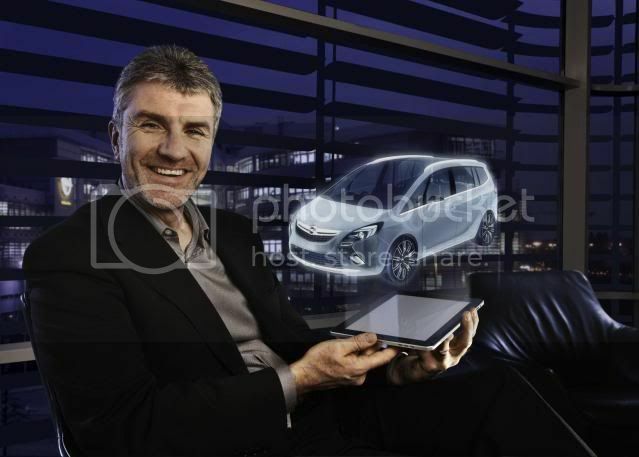 Vauxhall/Opel’s design executive Mark Adams is holding an iPad that the Zafira hologram is projected out of. The concept will premier at next month’s Geneva motorshow. 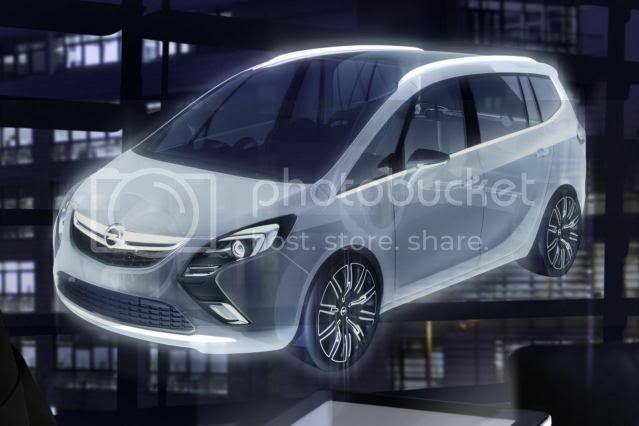 The image reveals the fascia will be inspired by the Ampera range-extending vehicle, as well as the trademark ‘blade’ appearing on the flanks. Mark Adams said: "We've applied the lounge concept to a motor vehicle. A lounge is a place you want to escape to and relax, a place where you really want to be. We wanted to offer the same feeling in a monocab and make it the lounge you want to spend time in." The newcomer won’t replace the current Zafira as the new Zafira will be bigger, more sophisticated, and intended to contend with the Ford Galaxy/S-Max, Renault Espace, and Chevrolet Orlando. The outgoing Zafira will undergo a comprehensive facelift and remain on sale. The next Zafira will adopt a Flex-7 seat system where the rear-most seats can be folded into the floor independently in a single motion. Power outputs on the petrol side will range from 120bhp (122PS/89kW) to 180bhp (183PS/134kW). Diesel engines will offer outputs from 110bhp (112PS/82kW) to 160bhp (162PS/119kW). The new Zafira will centre on GM’s Delta II platform, but will also be pushed upmarket with a higher sticker price and a quality feel as Vauxhall/Opel plans to detach itself from the Chevrolet Orlando. The 2012 Vauxhall/Opel Zafira is scheduled to debut at the 2011 Frankfurt motorshow.